Correct. You must allow the bus to move into your lane. Also, be aware that passengers (especially children) may be trying to cross the road, so be prepared to stop. If you see buses with 40kph speed limit signs and flashing lights on the back like the one below, it's compulsory to drive no faster than 40kph past this because it's a school bus dropping off or picking up children. 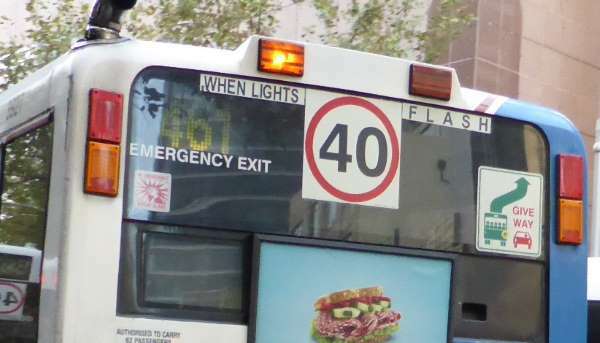 This is an example of a bus with flashing lights and a 40kph sign in the middle of Sydney. They keep flashing for about 30 seconds after the door closes and continue even after the bus moves off. This is to warn you that children might be crossing. School buses will also have flashing headlights. Children can be unpredictable and may try to cross the road when it's not safe to do so. Be prepared to stop when you see either the flashing headlights or taillights on a bus like this. The lower speed limit is because it takes much less time for you to stop from 40kph than 60kph, and if a child does run out in front of you and you hit it, there's much less likelihood of the child dying. Check out figure 1 in this scientific paper.